Multicultural Student Network looks totally different this year. Its mission remains the same: to promote cross-cultural understanding and positive relationships in support of student success while innovatively promoting the outreach, mentoring and recruitment of persons who represent the diversity of our global community, in an effort to broaden the availability and diversity of exceptional students who will become tomorrow’s successful contributors to society. However, this year the focus is primarily on mentoring. 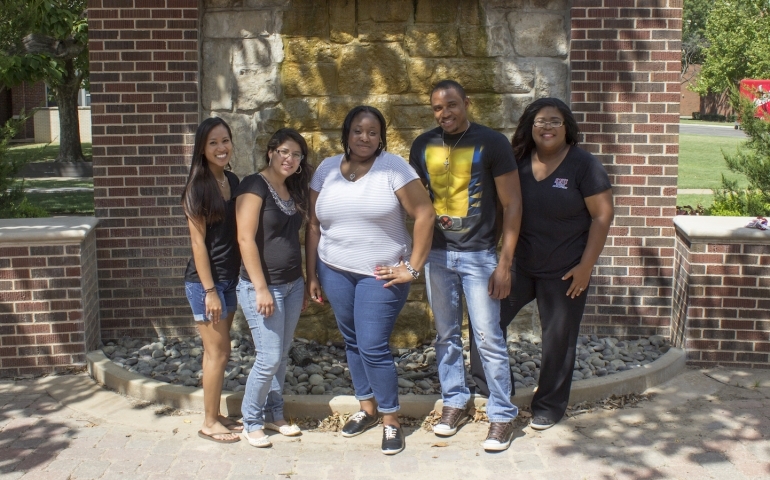 Students who are underrepresented can join the mentoring program. Students will meet together on the first Tuesday of each month at 7 p.m. Students who complete the program will receive a book scholarship at the end of the year. Frantz Pierre: I was born and raised in Port-au-Prince, the capital of Haiti. I grew up in a Christian family with two older brothers and one younger sister. I only knew my father from pictures and stories because I was 6 years old when he died. I was growing up in a country where approximately 30% of children attending primary school will not make it to third grade, and an additional 60% leave school before sixth grade. So, it was very unlikely for a kid like me, without a father and with 4 siblings and a very economically limited mother, to even have a chance to make it to first grade. I thank God that I had the privilege to have a strong and driven woman as my mother. She was a primary school teacher who made $500 ht a month (about $60 US) with 5 kids in a country like Haiti. As you can imagine, no sensible equation would ever predict any success in a situation like that. Her monthly payment went straight to rent and for the other basic needs, including food. We would have to live by faith, as she would say. With the help of God and my mother, I was able to graduate from high school in 2007. Until I graduated from high school, my dream was to become a doctor (a physician). But after graduation, I realized it was an unreachable goal for someone of my background in a country like Haiti. My only option was the public medical school. But, in Haiti there is only one public medical school, and it takes only 30 students for the whole country per year. Now, I have been given the chance to pursue my goal; I am a Bio-Chemistry student at Southern Nazarene University. Knowing what I have experienced, I have a passion and determination to work hard to make a difference and eventually use a medical degree to increase my effectiveness in this effort. Francis Cintron: I am half Puerto Rican and Mexican. I lived in Puerto Rico for five years, Mexico three years, Illinois for three years and in Texas five years. I am a missionary/pastor’s kid, and I have learned to appreciate a variety of persons and cultures. I want to keep learning from other cultures and teach others the best way to appreciate and coexist with others. I like adopting cultures, understanding why attitudes change by culture, and appreciating my own culture. I am a psychology major and Spanish minor. I accepted Jesus Christ as my savior when I was ten and helped in church with children since then. My plans for the future are to finish my four years at SNU and then pursue a Masters degree. Later, I’d like to go back to Mexico City to be with my parents and travel to different countries. Catalina Keo: I am a junior nursing major here at SNU. I am from Lawton, Okla. I ran cross country and track for two years while at SNU. I love to play sports, read, dance and travel. I would say I am a very outgoing person once you really get to know me. One random fact about me is that I hula danced for three years in high school… and, most importantly, I love Jesus! Jade: I was born and raised in Spencer, OK and graduated from Dove Science Academy. I am studying nursing and psychology and am involved widely in church. While at SNU, I’ve had the privilege to work as an RA for two consecutive years. While being active in the dorms was an awesome experience, God has really been tugging my heart to bring the campus together in other ways, like diversity. Coming from a background of an African- American father and a English/Jamaican mother, I have been grounded in “multi” cultures and see the unity in it. I would love to see SNU be a melting pot instead of a crayon box. With saying all of that, this year I am active in MSN and positioned as a mentor. Niya Smith: Since I can remember, I have always kept a smile on my face and a laugh within my heart. I love doing things for others and making sure they succeed. I will be graduating in December with my Bachelors of Arts in Psychology. I’m a very passionate person when it comes to life and people. One thing I’m very passionate about is cultural diversity and the acceptance of all people: black, white; Muslim, Christian, Jew and Hindu. Every person we come in contact with has a story, and each face we see is only a descriptor of the face of Christ. Cultural diversity is not a black thing or a white thing; it’s an individual thing that brings people from across all nations together. Diversity is not something that’s celebrated in February, May or September, but something that should be celebrated EVERY DAY, 365 days a year. We don’t get to pick and choose to be diverse, we ARE diverse and it’s time that we set aside old wounds, hatred, and anger towards one another for our differences and begin to embrace our individual cultures and lifestyles. It’s time we celebrate our differences!